I have a headache almost everyday. Some days I feel dizzy and my head feels very heavy. At night I experience horrible ear pain,both ears are affected.What ever side I lay on is the ear that wakes me up. I have seen two primary care Dr.,Two E.N.T doctors, a neurologist, an endocrinologist, three months of physical therapy, and chiropractors. I have had an M.R.I of head and neck; C6 and C7 have bulging discs.I do have pain in my neck and right shoulder. Yesterday went to a new Dr. and received a diagnostic facet injection. I do not think it helped. What do I do now? Concerning the neck shoulder and back pain, I am so glad that someone ordered an MRI for you to rule out aneurysm. This is one thing to be concerned about with ear pain as aneurysms can arise from the branching of the internal to the external carotid arteries. The external carotid artery runs near the ear and can result in ear pain. However, the best way to get a look at these arteries is an MRI of the brain AND an MRI of the neck. I would consider talking to your doctor about this. Most probably the neurologist can order this so insurance will cover it. A C6/C7 disc bulge is common in anyone over the age of 35, so unless there is a lot of neck spasming, this is not causing the neck pain. A true herniation of the disc could press on the spinal cord and cause problems but not a bulge. I would recommend that you see the neurologist again as headache is really within our specialty of neurology. Ask about a low dose of Elavil as it treats daily headache, helps you sleep and relieves neck spasms. It can also help with the dizziness if that is coming from spasms in the neck. This may be a form of cervicogenic headache. You do not give any more information about the headache, where it is located, or any other symptoms, so please talk to the neurologist and relay your concerns. Be sure to let them know that the facet injection had little effect. Do you think I have "cervogenic headaches"? I seldom had headaches until late in 2005, when I had a headache that wouldn't go away. It took a while, but finally I was diagnosed with a non-union type II fracture of Dens. Posterior fusion of C1/C2 in July 07. I spent the next 3 months in a Miami J collar. Fusion was successful, and all symptoms EXCEPT the headache are resolved. The headache is awful at times and my face and scalp are tender to the touch always. In every illustration I've seen on the web, my head hurts at ALL the places shown. I take Valium and/or ibuprophen when it gets really rough and that only dulls the pain. My PA put me on Lyrica, but the side effects are unacceptable to me (makes me feel slightly buzzed and I don't trust myself to drive). My natural good humor is suffering as is my ability to concentrate. I'm missing a lot of work because of the headaches. I've been to physical therapy several times, had cortisone shots and predisone treatment, and get massage therapy 2 to 3 times a month. Intense exercise seems to aggravate the pain as does high stress situations, extended computer sessions and telephone calls. 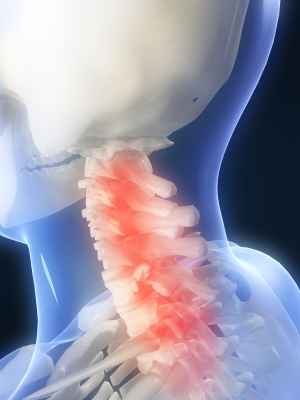 It is common for people to have neck pain and then headache after a cervical fusion. I work with someone with your same profile and somedays I don't know how she does it! Obviously you have seen a neurosurgeon or orthopedic surgeon who did the surgery. The problem is, (although we love our surgeons!) they don't manage pain too well. Basically, after the surgery, their job is done. If you have some tingling or numbness in feet and hands, Lyrica might have been a good choice, but is a poor one for headache and spasming. If you have read a page or two on the site about cervicogenic headache, then you can see that what you are describing may fit this profile. But some things are different. You do sound like you have a lot of spasming in the neck, which is referring to the scalp and causing the tenderness. But before I label you with just a cervicogenic headache, there are other things to consider. You have a history of a fusion and that may have irritated the cord and nerves around C1/C2. 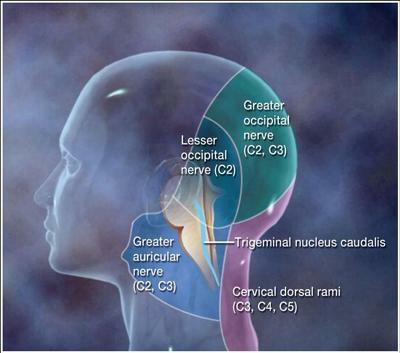 I posted the picture to show you how the cervical nerves influence headache. The trigeminal nucleus caudalis or TNC is the migraine center and many times a pathology at C1/C2 or C2/C3 kicks off migraines. See if you have any migraine symptoms. I would recommend that you consider seeing a headache specialist if there is one in your area. You may have to ask around, or ask your provider. You might also ask the PA to put you on amytriptyline which would be a good choice for you. The response is dose dependant..start at 10mg 2 hours before bed and work to the best dose for you. This is a pediatric dose and works well for daily headache, spasms, and helps calm down the spinal cord. Another choice might be tizanidine as that can be taken during the day, once sedation wears off (about 2 weeks). When starting that one I have patients take it at night for awhile, but it doesn't treat headache, just spasms. You mention that Botox helps, but no mention of occipital nerve blocks. If your neurologist hasn't done these, then I would highly recommend them as they will help with head and neck pain. Lamictal has shown promise for trigeminal neuralgia and we do a 5 day series of sphenopalantine blocks which also can help. Again ask the doctor. If the Botox is wearing off that soon, ask your doc about Dysport. There is some indication that it may last a bit longer, but no guarantee. The amounts to be used are 2 to 1-1/2 times the amount of Botox but your doctor will adjust for the particular muscle group targeted. What a relief to read your reply! You're right, I had a wonderful ortho/neuro surgeon at Swedish Spine Institute (Seattle, WA). And they don't understand/fix pain not associated with post surgical care. Hardware in the form of titanium screws (4) and rods(2) spanning C1 & C2. I have less than 50% of my total range of motion left for moving my head. (that's mechanical; directly the result of the surgery and can't be helped). As you suggested, I looked your page on migraine symptoms. I have most of the symptoms and they are getting worse. The migraine-like symptoms only occur after my neck goes into full blown spasming and a "headache" has started. I put quotes around "headache" because all of my pain is external of my skull. The inside seldom hurts. On bad days, I hurt down my front over the collar bone, and all over my upper back to the bottom of my shoulder blades. So far my PA and physical therapists are puzzled as to how to help me. Walking does help if I don't overdo it. I live in Fairbanks, Alaska. I just want to make it thru to retirement this summer. THEN I can go anywhere to learn how to cope and/or get treatments. Until then, I will print your reply and take it to my PA. Thanks again for relieving my worries! No problem..glad I could help. You might also consider going on the migraine vitamins of B2, Feverfew and magnesium if you are having migraine. Does the scenerio above sound like you? If not, or if you think you need more information please read about different types of headaches to find out which type of headache you are experiencing. I promise to use it only to send you Headache-Adviser Newsletter. Sign up for the RSS feed..it's free! Purchase one of the BEST pillows for neck pain, and start having a great nights sleep!